Kim and Reggie Harris combine a strong folk and gospel legacy with a solid background in classical, rock, jazz and pop music. Creative curiosity, years of road and stage experience and interactions with performers such as Pete Seeger, Ysaye Barnwell, Jay Leno, Tom Paxton, Bernice Johnson Reagon, Harry Belafonte and others, has led them to produce music that entertains and inspires. Born and raised in Philadelphia, PA, a city rich in cultural and musical heritage, Kim and Reggie’s early exposure to the diversity of musical styles and genres was nurtured in the schools and churches of their youth. Audiences at venues such as The Kennedy Center, The Brooklyn Academy of Music, The Smithsonian Institute, Reunion Arena in TX, the Psalm Festival in Graz, Austria, as well as a myriad of theatre arts centers, festivals, universities and schools, have given this inspiring duo standing ovations for their vibrant performances. 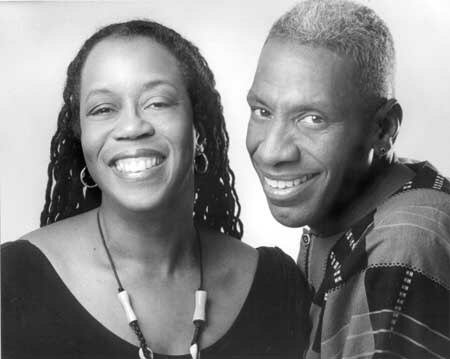 As a result of their CDs “Steal Away” and Get On Board” (Appleseed Recordings) and materials developed in their work with the Kennedy Center, Kim and Reggie have earned wide acclaimed for their contributions to the resources and knowledge base – in historical and educational circles – on the Underground Railroad and the modern civil rights movement. With numerous recordings on the Appleseed Recordings and the Folk Era labels they are also featured on a number of compilations, films and educational projects worldwide. Kim is presently pursuing a Ph.D. at Union Theological Seminary in NYC and both continue to write, record and produce music as a means to promote creativity, education, social responsibility and understanding in the world community! Kim and Reggie Harris are dynamic and superbly talented traditional folk performers, whose captivating stage presence and unique harmonies has earned the respect and love of audiences throughout the US, Canada and Europe for over 30 years. They are unique in their ability to entertain audiences of any age and background as they blend their talents as singers, songwriters, educators, interpreters of history and cultural advocates.